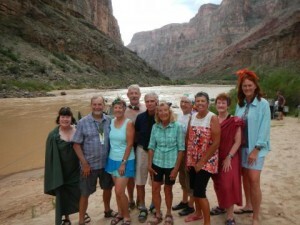 If You Want the Experience of a Lifetime, Sign Up For Western River Expeditions’ Grand Canyon 7-Day Rafting Trip. We were a little apprehensive at first, but it didn't take more than 5 minutes after meeting our Western River guides, Evin and Justin, to put us at ease. I went from sitting on the "box" in front the first day to sitting on the "tubes" for the rest of the trip. The exhileration I felt after the first wave hit was unbelievable. I couldn't wait until the next rapid and on the last day, to survive a 12-foot wave - well, it was just a dream come true. The views of the Grand Canyon are fantastic. The stories and geology our guides told us were so meaningful. Every day, we would do 2-3 hikes to beautiful waterfalls or explore old mines. Sleeping under the stars was the ultimate experience - watching shooting stars, satalites and the rising moon. As for the food - it was gourmet and lots of it. All 18 of us became fast friends and had lots of fun doing the "fire line". The helicopter flight to the Bar 10 Ranch and airplane flight back to Marble Canyon were additional highlights. We came away from the trip happier, stronger and with a wonderful feeling of accomplishment. We can't thank Western River Expeditions enough.